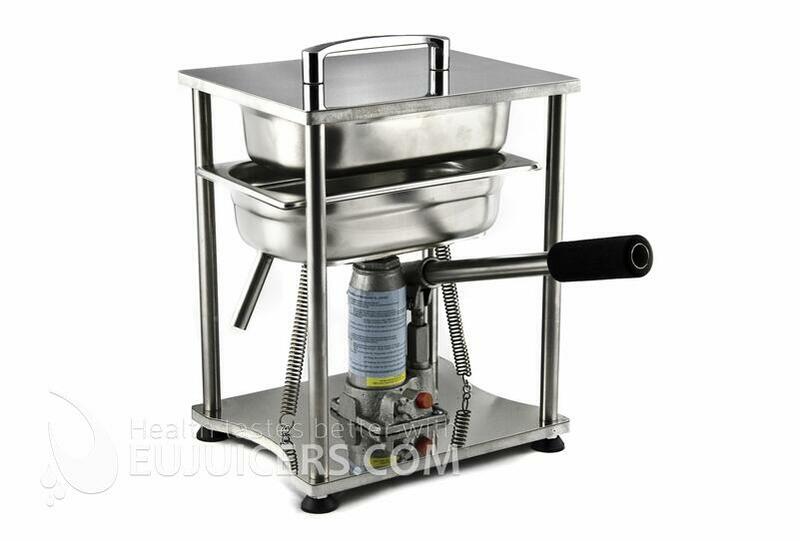 JASNA juicer is a mechanical hand press that uses pressure to squeeze juice from a pre-crushed produce. Fruits and vegetables are first ran through a classic juicer with blank screen (for example single auger juicer) and then pressed under high pressure (up to 2 tons) in JASNA juicer. Crushed produce is placed in a cloth that is being folded several times and then put on a matel bowl. All this is then placed on the hydraulic plate. After pumping with the hydraulic arm the pressed juice starts to flow out of the cloth. Once the pressing is finished and all the juice has come out the hydraulic arm is released and the whole process repeats. This method of pressing is one of the most effective ones. When compared to all juicers we have ever tested, the juice from JASNA juicer is the purest and without any signs of pulp. 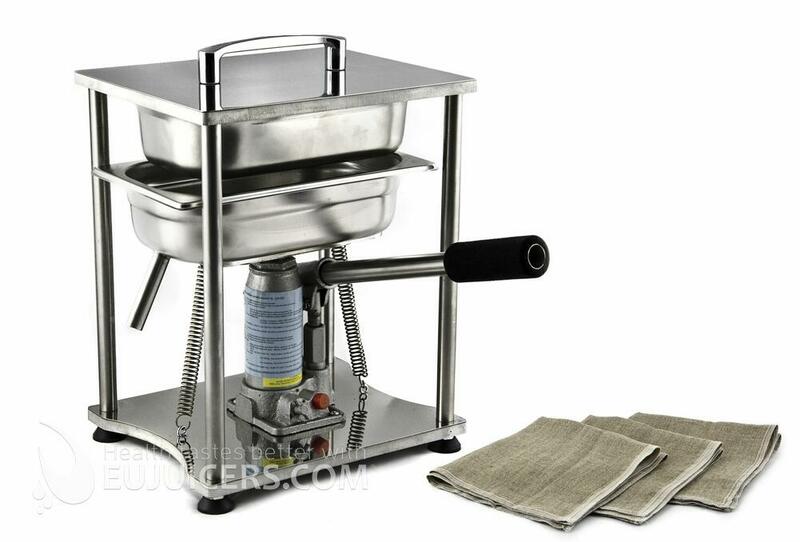 The main disadvantage which we see with this juicer is that a 2nd juicer with blank screen is necessary to chop up the produce before being pressed with this juicer. When handling the pre-crushed produce from the 1st juicer, and moving this over to the JASNA juicer, you might end up spilling a little bit of pulp on to your counter top. 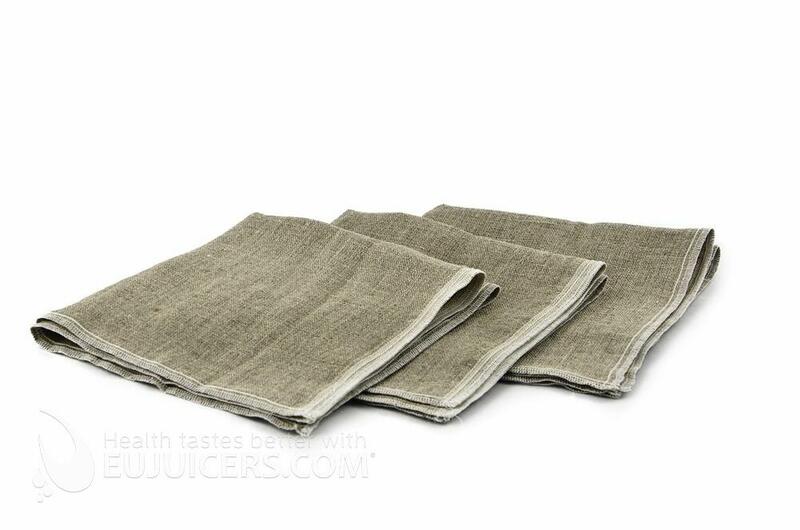 We at EUJUICERS are not big fans of multiple use of the same cloth. Rinsing and then boiling the cloth (sterilization) and then immediate freezing is the best solution for this. Even though there are few cons we still see the JASNA juicer as one of the best machines when it comes to the juice quality and quantity. This is particularly interesting for people interested in the Gerson Therapy and are looking for a low cost/high result solution. You can buy a replacement bag in our e-shop here. Bag for Hydraulic Press Jasna - 1Pcs.